I didn’t think it was possible but I think I hit my fresh peach threshold. I have been eating as many as two to three fresh juicy ripe peaches every day for the past week, or so. Peaches are still abundant at the market and I never make it out the market door without 4 or 5 in my hands. Time to turn on the oven and start baking some peaches! Being the rustic baker I am, naturally I would make a cobbler, crostata, galette or a buckle. A buckle? My mom loved cobblers and she taught me how to make a very good blackberry cobbler, which I will be making soon. I already made a lovely blueberry crostata and posted it. So, for now a peach buckle. A buckle is assembled with the cake on the bottom and the fruit on top. As it bakes the fruit slightly sinks to the bottom while the cake rises around the fruit, causing it to “buckle”. Simple, rustic and absolutely delicious. You may want to serve it warm straight from the pan with either a splash of cream or ice cream. Pour melted butter into a 2 quart baking dish. In a mixing bowl, combine sugar, flour, baking powder and salt. Mix to blend. Stir in the milk and vanilla until blended. Pour the batter over the melted butter. Arrange the peach slices over the batter and bake for 30 minutes or until browned. The top will be brown and the cake will begin to pull away from the sides of the pan. This sounds delicious! I have a peach tree and have been wanting a good recipe to try. I’m going to make this today. I have Drew today and she loves peaches so I’m sure she’ll love this too. You maybe getting close to your peach thresh hold, but what a beautiful way to get there. Every summer my mom used to make peach ice cream. I always thought it was a waste of peaches, ice cream, and my arm. Yes, I churned. Now, that buckle with a healthy scoop of vanilla bean ice cream. Delicious! Oh! Back in the day when churning and rock salt was needed to make ice cream! :) Fresh peach ice cream had to be incredible. Lovely post… I like the part of recreating what your Mom used to make in her kitchen. Thanks for the fragrant and delicious reminder…I need to get baking. This is gorgeous. It’s hard to believe it’s so easy to make something so decadent, but it’s fresh and light as well. Thanks for sharing. I might actually make this! I too have a ton of peaches that I don’t know what to do with. I thought this was best eaten warm, even without the cream. Beware! There is a lots of butter in this recipe, but you are right in your description of “decadent”. :) I just love the taste of cooked peaches! And this recipe was so good in allowing the peach to shine. And you can not get any easier than putting one of these together. Oh TOTALLY yum :-) ! I’ve never heard of a buckle before, but it looks delicious! From what I have read a buckle is one version of a cobbler typically with a yellow batter. I am amazed of the variety of cobblers and more so with the naming of each one! There is a brown Betty, a grunt, pandowdy, a slump! It’s quite humorous to me! This is my sort of dessert. Maybe that’s why I love crumbles as they’re so easy to make. Even though I hardly ever make them. Really must bake more desserts, especially as it feels like Autumn here at night already. We are sharing the same weather here. Today was very Autumn like…cloudy and rainy all day. Makes me want to make a soup! This is so simple and delicious! It does remind me of Mom’s blackberry cobbler…thank you for this! Awwww. I know! I remember calling mom because I had a huge bowl of blackberries and asking her what to do with them. She gave me a blackberry cobbler recipe right then and there and it was so comforting and delicious! Thank you for commenting sis! I just love a good buckle. Peaches are at their peak right now at the farmers market. Have to try this, sounds and looks really delicious. This was the first time I made a buckle. So easy and fuss-free (for my baking abilities) I’ll be making more using other seasonal fruits as well. But, oh…the peaches. I love them. I’m with you on the peaches. I’ve been enjoying them daily, too. I wait all year for a good tasting, juicy peach and I’m going to have my fill before they leave! I make a similar dish but called it a cobbler. Never did hear of a buckle. No matter, I bet yours is a delicious dessert, especially when served warm with a bit of ice cream. Yum! I’m in the same situation with peaches and nectarines. Very nice cake idea. I’ve never heard of the “buckle” before, but it has the feel of a clafoutis. Nice post. Thanks Leah. Summer is headed your way! We are having our first signs of Autumn over here, which I welcome. I’m a “cobbler maker” too Karen. I would say the only difference was the batter didn’t rise quite so much as a cobbler. The buckle was a little flatter and it didn’t have those wonderful poofs of cake. They are very similar otherwise. Very nice indeed. I am envious of your peach supply. Fortunately, I have not yet reached the “peach threshold!” And I’d love to try this along with a blog of whipped cream. It looks so fresh and delicious!! thanks! Thank you. :) It really is buttery delicious! I’m actually back to eating lots of peaches again this week! 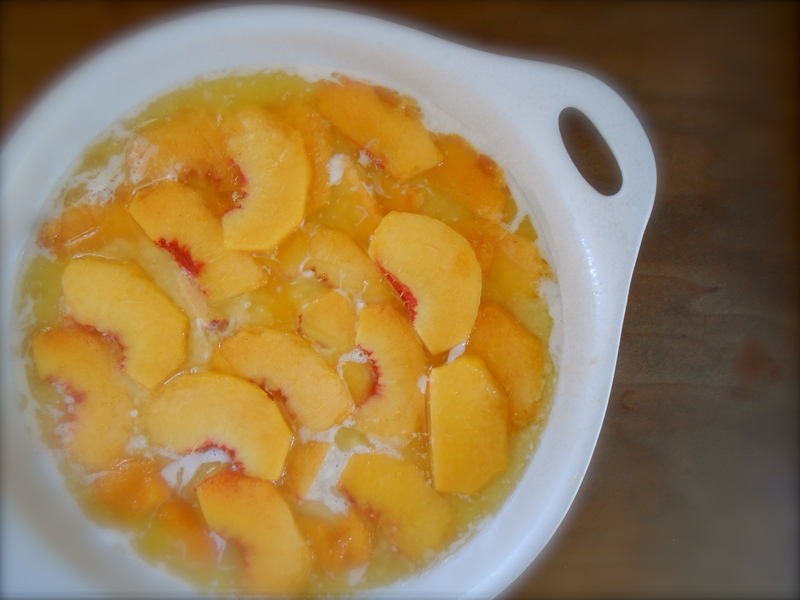 Crumbles, crisps, cobblers, etc are my favorite way to enjoy peaches. Yours looks amazing and dreamy! Thank you. 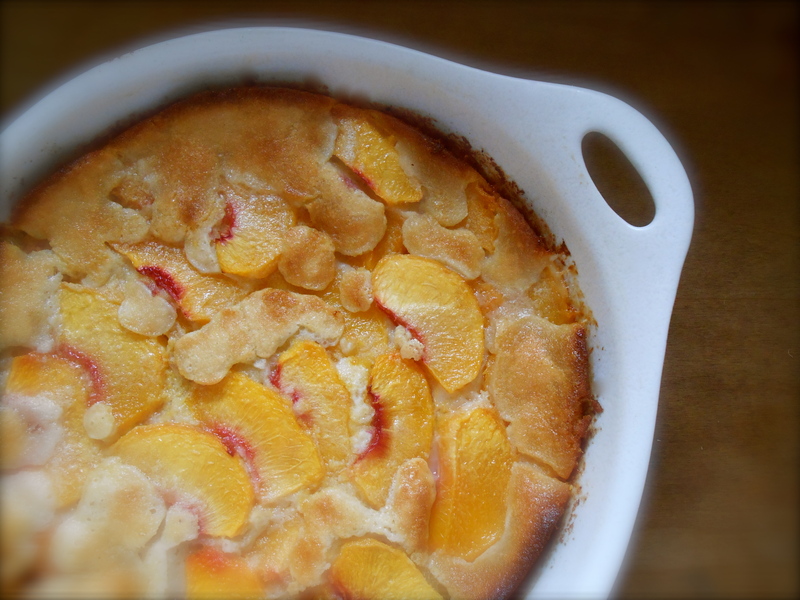 I’m with you…I love peaches best in crumbles, crisps and cobblers. What a perfect dessert featuring fresh peaches! You are currently reading peach buckle at COTTAGE GROVE HOUSE.